Yu Xiaogang created groundbreaking watershed management programs to aid communities displaced by dam construction. His work led to social impact assessments being included in large development projects. Environmentalist Yu Xiaogang created groundbreaking watershed management programs in China, a country that has spent decades trying to tame its powerful river system by building hydroelectric power plants. Yu created the Lashi watershed project after writing a social impact assessment on the effects of a dam built at Lashi Lake for his Ph.D. thesis. The dam had destroyed the local ecosystem, severely disrupting the lives of fishermen and farmers in the area. As farmland was destroyed by the dam, villagers turned to fishing. Then, as fish stocks dwindled, birds ate the seeds and grain from the remaining fields, further jeopardizing the people’s well-being. Yu brought together residents, the local government authorities and private entrepreneurs to rebuild the area, which today is acclaimed as one of the top 10 sustainable developments in the country. Among the project highlights were establishing a township watershed management committee, a lake-based community fishery association to protect wetland ecosystems and fish resources, minority women’s schools and micro-credit loan programs, poverty reducing projects and road-building projects. All involved the participation and empowerment of the local villagers. It was the first watershed project in the county to involve NGOs, residents and the local authorities. In 2002, Yu submitted a report to the central government on the social impact of the Manwan Dam on the Lancang (Mekong) River, which prompted the government to give the local community $8.7 million in additional resettlement funds to mitigate the negative social impact of the dam. In the past, dam-building plans were simply dictated by government officials, but today, thanks to the advocacy efforts of Yu and others, the Chinese government now includes a social impact assessment in the decision-making process for all proposed major development projects. While Yu’s work has illustrated dams’ potential negative impact on communities, huge dam projects still are being proposed. As China’s economic health improves, pressure increases to supply more power by building hydroelectric power plants on the country’s river system. In 2003, the Yunnan provincial government announced plans to construct 13 new dams on the Nu River, one of the Three Parallel Rivers—the Nu, the Jinsha (Yangtze) and the Lancang (Mekong.) The Three Parallel Rivers and surrounding watersheds are a World Heritage Site, the epicenter of Chinese biodiversity containing virgin forests, 6,000 species of plants and 79 rare or endangered animal species. The dams would forcibly displace 50,000 people, indirectly affect the livelihoods of millions living downstream in China, Burma and Thailand, and negatively affect the flora and fauna in the surrounding areas. Yet, development continues, despite the lack of river management plans, public input and participation by affected villagers. Yu used the story of Lashi Lake and Manwan Dam to educate villagers in the Three Parallel Rivers area, taking them by bus to dam-affected communities on the Mekong River. There, villagers saw men and women, their way of living wiped out by the dam, picking through garbage dumps for scrap to sell. Yu also worked with CCTV on a television program about the effect of dams that aired nationwide. In 2004, Premier Wen Jiabao suspended plans for the dams on the Nu River, saying more research and scientific analysis was needed. The project still is on hold, but the provincial government, intent on building the dams, has proposed a scaled-back version with four dams. Yu is particularly interested in empowering the local villagers in the dam decision-making process through workshops and training programs. In 2004, he took five village representatives to a United Nations symposium on dam issues in Beijing, where they met with high-level government officials, dam company CEOs and experts on dam construction. Yu’s goal is for Chinese NGOs to advocate for the institutionalization, implementation and practice of social impact assessments for the interests of communities that are threatened by dam construction. Yu Xiaogang, receiving his award at the 2006 Goldman Prize ceremony. Yu Xiaogang, accepting his award at the 2006 Goldman Prize ceremony. Yu Xiaogang holding meeting will village elders at Lashi Lake Watershed Project. 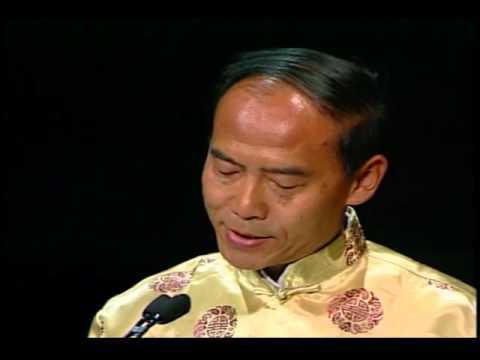 Yu Xiaogang, winner of the 2006 Goldman Environmental Prize for Asia (China).